Good To Begin Well, Better To End Well: Forged By Fate COVER REVEAL!!!!! The time has come AT LAST, and today is the day! 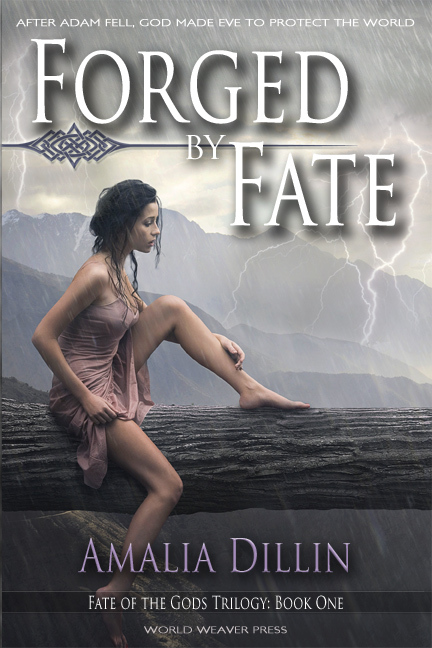 Forged by Fate cover art is HERE! And look!!! LOOK AT HOW PRETTY IT IS!!!!!! Add it on Goodreads, if you haven't! And don't forget to order your copy on March 5th!! After Adam fell, God made Eve to protect the world. — Adam has pursued Eve since the dawn of creation, intent on using her power to create a new world and make himself its God. Throughout history, Eve has thwarted him, determined to protect the world and all of creation. Unknown to her, the Norse god Thor has been sent by the Council of Gods to keep her from Adam’s influence, and more, to protect the interests of the gods themselves. But this time, Adam is after something more than just Eve’s power — he desires her too, body and soul, even if it means the destruction of the world. Eve cannot allow it, but as one generation melds into the next, she begins to wonder if Adam might be a man she could love. Every god, from each of the world’s pantheons, mythologies, and religions — they’re all real in this enthralling fantasy romance that spans centuries. This is gorgeous. And a wonderful book to boot! Haha, thanks!! I think so too! It's so gorgeous, World Weaver did a fabulous job. Have you got to hold one yet?